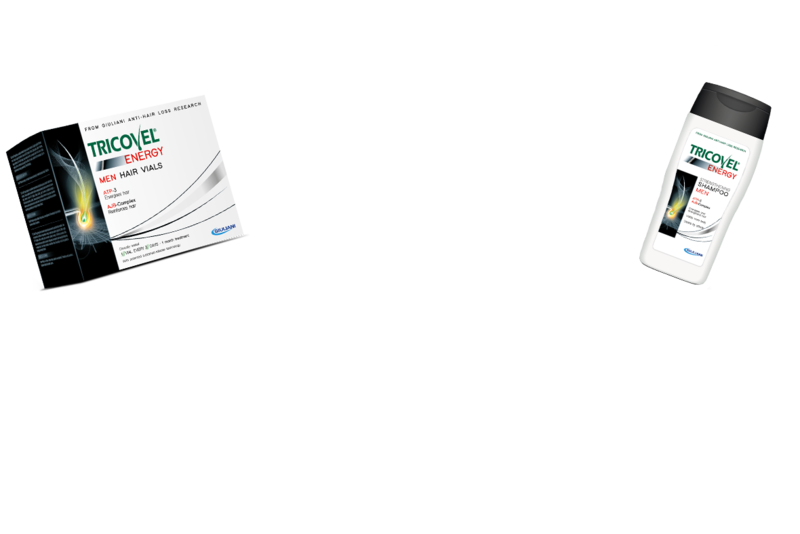 If you too are always looking for safe, reliable and, above all, effective products for hair, Energy is the innovative Tricovel® line specifically designed for men’s hair. Consisting of a food supplement in tablets form, vials for application on the scalp and a strengthening shampoo, Tricovel® Energy line is the result of Giuliani Anti-Hair Loss Research, which has been developing cutting-edge solutions for hair care for over 25 years. Recent studies have shown that the hair follicle, to support the normal growth of hair and its continuous renewal, needs a large amount of energy, normally provided by body’s energy metabolism. In men several factors including stress, smoking, unbalanced diet and, sometimes, genetic inheritance and hormonal imbalance can weaken hair and generate a lack of energy, resulting in a progressive shortening of its growth phase. For hair to grow, it is essential that follicle is healthy and has energy to perform its physiological functions. ATP-3, patented combination of 3 active ingredients – Arginine, Caffeine and Carnitine – involved in the processes of cellular energy metabolism. In vitro studies have shown that their synergy can increase energy production at cellular level. AJB-COMPLEX, combines Ajuga Reptans with Biotin, vitamin that helps to maintain healthy hair. 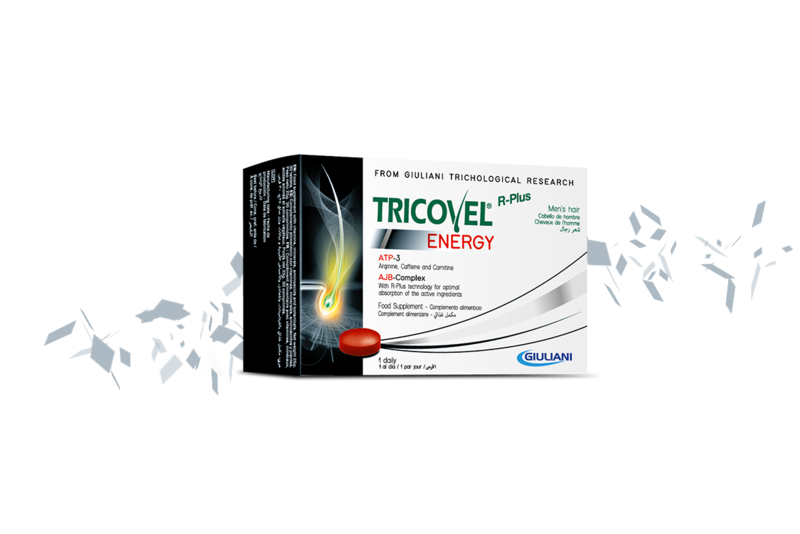 Tricovel® Energy line acts in a targeted way on men’s hair: the food supplement in tablets form works from within, providing vigour and body to hair*; the vials provide energy to the follicle from outside; the strengthening shampoo is the ideal complement to the action of Energy tablets and vials. 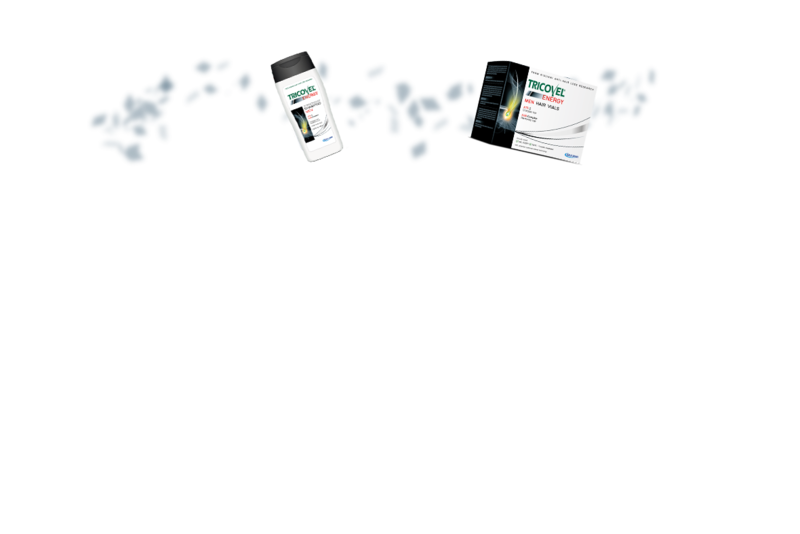 *Results of a clinical trial on 100 men taking one tablet daily for 3 months.